Thrilling adventure stories introducing young readers (ages 8-12) to Christian heroes of the past. Eleven-year-old Niwa is from Ecuador's Huaorani tribe, better known as the Auca tribe, which is known for killing outsiders. The Aucas trust no one, not even neighboring tribes, so when young Niwa is outlawed by his own people for angering another tribe, not even his family will protect him. Then a huge "woodbee" flies overhead, dropping gifts to Niwa's tribe from pilot Nate Saint and the other members of a missions team hoping to share the Gospel with them. Alone and afraid, Niwa is excited by the prospect of outsiders who want to help him. 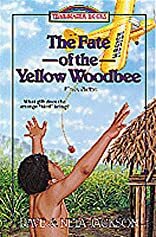 He even wants to make friends with the mysterious strangers and convince his tribe that the people in the strange woodbee will not harm them. But when someone else from the tribe lies about the five men wanting to attack them, the whole village wants them dead except for Niwa. Will he get there in time to stop the killing? In a tribe of killers, one boy longs for peace -.